World-renowned architect Frank Gehry’s first and only Australian building has reached a literal high point with the topping out of the structure. 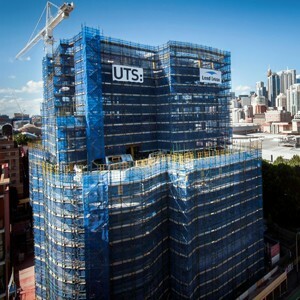 Unveiled in December 2010, Gehry’s $150 million University of Technology, Sydney’s (UTS) Dr Chau Chak Wing building is already a prominent feature of south Sydney CBD, even with the distinctive brick façade still hidden behind scaffolding. “Construction has progressed to the stage that there can be no doubt that this is a Gehry building and a fantastic one at that,” said UTS Vice-Chancellor Professor Ross Milbourne. Based on the concept of a tree house, the building will house the UTS Business School, where up to 2,390 students and staff will study and work at any given time. The tree house plans, which Gehry said are based on the idea of “a trunk and core of activity and…branches for people to connect and do their private work”, were approved in March 2012. The building is expected to be one of Sydney’s greenest education buildings, with a 5 Star Green Star – Education Design v1 rating. It will be the second university building in Sydney to achieve this rating. Its key sustainability features include high-performance glazing, energy-efficient building services, water-efficient fixtures, and a 20,000L rainwater tank. Sustainably sourced timber will be used in construction, while digital dashboards will communicate the building’s sustainability features. With the building’s main structure now completed, contractor Lend Lease has moved on to the next phase of the project – construction of the curvilinear brick façade. “We’re using state-of-the-art construction methods including building information modeling and combining it with traditional artisan techniques in order to deliver this unique Frank Gehry design,” said Managing Director of Lend Lease, Building, Murray Coleman. Approximately 320,000 bricks will be laid by hand over the coming months. Custom-designed by Austral Bricks, five buff coloured brick shapes will make up the building’s undulating brick exterior, referencing Sydney’s urban brick heritage. Austral Bricks reports that the first delivery of bricks for the building has already been completed. Each brick range will have a specific function for the facade, which "does not have one straight line", the Sydney Morning Herald reports. The 'K-brick', for example, has been designed with an angled protrusion to create the required bends and shadowing. For the west-facing façade, large, angled sheets of glass will fracture and mirror the images of surrounding buildings. To minimise any risk associated with this element of the construction process, the design team undertook extensive façade testing with full-size prototypes in China, as well as UTS’ own specialist civil engineering labs. Internally, some signature spaces have taken shape, such as the three-storey void on the ground floor, which will house the ‘oval classrooms’. The Dr Chau Chak Wing Building is the centrepiece of UTS’ $1 billion City Campus Masterplan, a ten-year design and construction program that will transform both the university and the southern CBD of Sydney. It is expected to open in mid-2014 at a total development cost of $180 million.